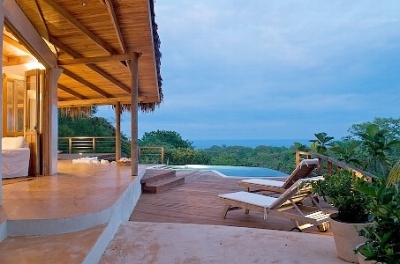 Chez Mu is nestled on a hilltop above Montezuma. The Villa offers tropical luxury at its finest. It has just been remodeled, with a new pool and modern furnishings. The Villa can accommodate a large family or several couples. The home is in the middle of a lush 3+ acre property, which ensures absolute privacy and tranquility. White faced and howler monkeys, as well as parrots. hummingbirds and many other varieties of birds can be seen daily. The hilltop setting provides panoramic views of the jungle and ocean, as well as a steady and refreshing breeze (and no mosquitoes!). Plenty of deck space near the pool could become the backdrop for a very special wedding party and is perfect for yoga. It is only 5 minutes from downtown Montezuma (cozy town with amazing beaches), 15 minutes from Cobano (bank, doctor, supermarket) and 25 minutes from Malpais (incredible sunsets and surfing). Chez Mu is the perfect honeymoon retreat, or tropical destination for your entire family! Deck area from master bedroom - relax in paridise! Pool deck - Breathtaking jungle and ocean views. Melt your troubles away in the infinity pool. Second private deck for upper rooms. Couples will love the cozy master rooms. Three large and comfortable bathrooms. Nature lovers: Actual photo taken from the deck. Brand new A/C in all bedrooms. Modern furnishings. Upper bedrooms with a private terrace. Independent water heaters for each bathroom. - Wireless Internet. - 42' plasma with Direct TV and DVD movie library. - Harmann Kardon boombox to play your iPod tunes. - 3-stage water filtration system for potable water in the kitchen. - Safety boxes with digital access code in all rooms (fits laptops). - Crib for the little ones. - Beach towels. - Professional grade binoculars to watch the wildlife and the stars. - Exhaustive activity guide and manual to the house, 'Chez Mu Guide'. - New concrete road leading up to the house, with parking for 3 cars. - Flood-lit trees and trail thru the gardens. - Housekeeper in nearby cabin (husband and wife) clean the house daily, provide assistance and will prepare meals if asked. Local taxes included in above prices. An additional $10 per day housekeeping fee will be added to the total cost of the reservation. We encourage you to provide an additional tip directly to the housekeepers at the end of your stay if you're satisfied with their service. 50% required upon reservation, remaining 50% 1 month before arrival. Reservations under $1,000, 100% required to book. Payment accepted via Homeaway, PayPal, credit card or wire transfer. No surcharge for credit cards. No security deposit is required, but guests are responsible for any damages.